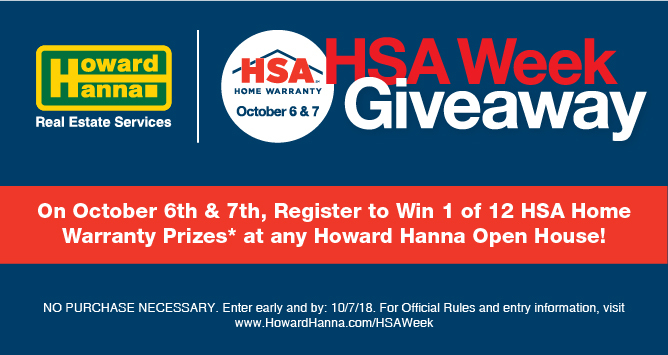 Entrants must complete a “register to win” entry form (via physical registration form or online at https://www.howardhanna.com/HSAWeek/Win) at any Howard Hanna open house from Saturday October 6, 2018 thru Sunday October 7, 2018 . One entry per person, per open house. 12 total winners will be selected by random drawing from all entries to win one of (12) HSA Buyer Home Warranties through Howard Hanna Insurance Services valued at $475.00 (PA/OH), $460.00 (MI) and $480.00 (VA/NC) each. Number of winners vary per market: Ohio (4), Pittsburgh (3), West Virginia (1), Erie (1), Harrisburg (1), VA/NC (1) & MI (1). No entry fee is required and winner need not be present to win. The winning entrants will be notified by phone/mail within one week of the drawing. 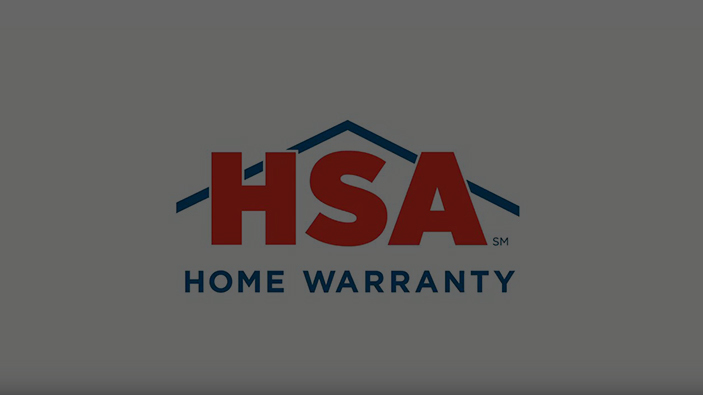 The home warranty prize is valid for use only on a home purchased or listed with Howard Hanna or for a one-year extension of a current HSA Home Warranty on a home purchased through Howard Hanna. Winner must comply with all terms and conditions of these Official Rules in order to claim a prize. No cash or other substitution, assignment or transfer of any prizes permitted, except by Sponsor, who reserves the right to substitute a prize or prize component with cash or another prize of comparable or greater value. Winner is responsible for all federal, state and local taxes and fees associated with prize receipt and/or use. Prizes will be awarded “as is” with no warranty or guarantee, either express or implied offered by Sponsor. Odds of winning a prize depend on the number of eligible entries received. Limit: One (1) Prize per person. All completed forms must be received by Howard Hanna Real Estate Services at each open house before the conclusion of the scheduled event on October 7, 2018. Winners will be determined by random drawing to be conducted on or about October 12, 2018, and winning names will be announced via the Howard Hanna Facebook page. Howard Hanna Real Estate Services will conduct the drawing and its decision is final. No entries will be returned. All federal, state and local laws and regulations apply. Void where prohibited by law. The promotion is open only to legal residents of the fifty (50) United States and the District of Columbia who are at least eighteen (18) years old at the time of entry. Employees of Howard Hanna Real Estate Services and any of its affiliate companies, as well as the immediate family (spouse, parents, in-laws, siblings, and children) and household members of each such employee are not eligible. Participation in the promotion constitutes entrant’s full and unconditional agreement to these Official Rules and Sponsor’s decisions, which are final and binding in all matters related to the promotion. Winning a prize is contingent upon fulfilling all requirements set forth herein. Except where prohibited, participation in the promotion constitutes winner's consent to Sponsor's use of winner's name, likeness, photograph, voice, opinions, biographical information, hometown and state for promotional purposes in any media without further payment or consideration. Sponsor is not responsible for problems with the submissions, including, but not limited to, lost, late, incomplete, invalid, unintelligible, or misdirected entries, which will be disqualified. Sponsor reserves the right, in its sole discretion, to modify, suspend, or cancel the promotion, and select the winner(s) from the entries received prior to the modification, suspension, or cancellation. Sponsor agrees to take such action in a fair and appropriate manner. In addition, Sponsor reserves the right, in its sole discretion, to disqualify any individual it finds to be tampering with the submission process or the operation of the promotion or to be acting in violation of these Official Rules or any other promotion, or in an unsportsmanlike or disruptive manner. Any attempt by any person to deliberately damage any other entrant’s submission or undermine the legitimate operation of the Promotion is a violation of criminal and civil law, and, should such an attempt be made, Sponsor reserves the right to seek damages from any such person to the fullest extent permitted by law. Sponsor's failure to enforce any term of these Official Rules shall not constitute a waiver of that provision. BY RECEIPT OF ANY PRIZE, WINNER AGREES TO RELEASE AND HOLD HARMLESS SPONSOR AND ANY PROMOTIONAL PARTNERS, OF EACH OF THEIR PARENT, SUBSIDIARY, AFFILIATE AND RELATED COMPANIES, AND EACH OF ITS AND THEIR RESPECTIVE OFFICERS, DIRECTORS, EMPLOYEES, AND AGENTS (COLLECTIVELY THE “RELEASED PARTIES”) FROM AND AGAINST ANY LOSSES, DAMAGES, RIGHTS, CLAIM OR CAUSE OF ACTION OF ANY KIND ARISING, IN WHOLE OR IN PART, DIRECTLY OR INDIRECTLY, OUT OF PARTICIPATION IN THE PROMOTION OR RESULTING DIRECTLY OR INDIRECTLY, FROM ACCEPTANCE, POSSESSION, USE, OR MISUSE OF ANY PRIZE AWARDED IN CONNECTION WITH THE PROMOTION, INCLUDING WITHOUT LIMITATION PERSONAL INJURY, DEATH, AND/OR PROPERTY DAMAGE, AS WELL AS CLAIMS BASED ON PUBLICITY RIGHTS, DEFAMATION, AND/OR INVASION OF PRIVACY. The Released Parties are not responsible for: (1) any incorrect or inaccurate information, whether caused by entrants or by any of the equipment or programming associated with or utilized in the promotion; (2) unauthorized human intervention in any part of the entry process or the promotion; (3) technical or human error which may occur in the administration of the promotion or the processing of promotion submissions, including, but not limited to, malfunctions, interruptions, or disconnections in phone lines or network hardware or software; (4), late, lost, undeliverable, or damaged mail; or (5) any injury or damage to persons or property which may be caused, directly or indirectly, in whole or in part, from entrant’s participation in the promotion or receipt or use of any prize or while traveling to or from any prize-related activity. Each winner also further acknowledges that the Released Parties have neither made, nor are in any manner responsible or liable for, any warranty, representation or guarantee, expressed or implied, in fact or in law relative to any prize or this promotion including but not limited to quality, condition or fitness for a particular purpose. If for any reason an entrant’s submission is confirmed to have been erroneously lost, or otherwise destroyed or corrupted, entrant’s sole remedy is another submission and thereby another entry into the promotion. No more than the stated number of prizes will be awarded. Entrant agrees that: (i) any and all disputes, claims and causes of action arising out of or connected with this promotion or any prizes awarded shall be resolved individually, without resort to any form of class action, and exclusively by the appropriate courts located in the Commonwealth of Pennsylvania, U.S.A.; (ii) any and all claims, judgments and awards shall be limited to actual out-of-pocket costs incurred, including costs associated with entering this promotion but in no event attorneys’ fees; and (iii) under no circumstances will entrant be permitted to obtain awards for and entrant hereby waives all rights to claim punitive, incidental and consequential damages and any other damages, other than for actual out-of-pocket expenses, and any and all rights to have damages multiplied or otherwise increased. SOME JURISDICTIONS DO NOT ALLOW THE LIMITATIONS OR EXCLUSION OF LIABILITY FOR INCIDENTAL OR CONSEQUENTIAL DAMAGES, SO THE ABOVE MAY NOT APPLY TO YOU. All issues and questions concerning the construction, validity, interpretation and enforceability of these Official Rules, or the rights and obligations of the entrant and Sponsor in connection with the Promotion, shall be governed by, and construed in accordance with, the laws of the Commonwealth of Pennsylvania, U.S.A. without giving effect to any choice of law or conflict of law rules (whether of the Commonwealth of Pennsylvania, U.S.A. or any other jurisdiction), which would cause the application of the laws of any jurisdiction other than the Commonwealth of Pennsylvania, U.S.A. Sponsor: Howard Hanna Real Estate Services, 119 Gamma Drive, Pittsburgh, PA 15238. Home Security of America, Inc. (HSA) is not a participant in or sponsor of this promotion., except that Home Security of America is the provider, manager, claims servicing and administrator of the warranty program.